Actinobacillus pleuropneumoniae (APP) is one of the pathogenic bacteria causing severe swine disease in Vietnam as well as other pig-raising countries in the world. APP can be found as the major causative agent of an outbreak of respiratory disease in a farm or it can be an opportunistic pathogen after immunosuppressive infection in pigs such as the disease of PRRSV, PCV2, CSFV or Mycoplasma hyopneumoniae. Currently, APP is controlled by using antibiotics and some imported vaccines. Besides the studies of vaccine efficacy and antibiotic resistance of the bacteria, one study was aimed to produce antigen mass of APP for vaccine development in laboratory condition. Three liquid medium (Brain Heart Infusion – BHI broth, Muller Hinton – MHI broth and Tryptone Yeast Extract – TYE broth) was used to evaluate the growth ability of APP in the condition of supplementing with 10 µg of nicotinaminde adenine dinucleotide per ml of media. Resultant optimal media was used to determine its growth curve and mean generation time (MGT). To generate inactivated whole-cell antigen, the APP suspension was treated with different formaldehyde concentration (0%, 0.05%, 0.1%, 0.2% and 0.4%). Results indicated that BHI medium was the best for growing APP, in which, the lag phase was 2 hours and the time to enter exponential phase was 2-6 hours, and the stationary phase lasted for 18 hours before death phase. The mean generation time (MGT) is about 27 to 28 minutes. The minimum formaldehyde concentration and time to kill all the APP cells was 0.1 % for 2 hours of incubation. This presentation will include different aspect of APP in Vietnam such as prevalence, vaccine use, antibiotic use, antibiotic resistance, clinical signs and research result of antigen mass production. 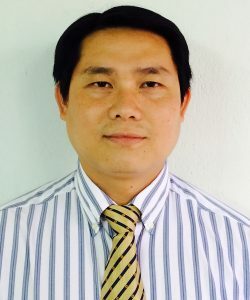 Dr. Phat is presently a lecturer and a researcher at Nong Lam University Ho Chi Minh City, Vietnam (formerly named University of Agriculture and Forestry). With the experiences about molecular techniques and viral biology obtained during his doctoral and postdoctoral programs in the University of Nebraska – Lincoln (NE, USA), he is now also serving as a consultant for clinical/molecular diagnosis of veterinary diseases, vaccine application in practical condition of animal farms and doing research for vaccine development. He has 14 peer-reviewed papers published.